J/News Articles: J/111’s Sailing FUN Down Under! (Melbourne, Australia)- Rod Warren, the owner of the J/111 JOUST in Melbourne, Australia, provided this report on the Australian J/111 Class activity. “We started our season with a regatta held at the Blairgowrie Yacht Squadron. 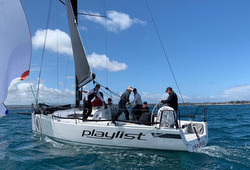 Five boats, JAKE, JOUST, PLAYLIST, SCARLET RUNNER and VELOCE, competed in the 42 km passage race, followed by four windward-leewards held in medium to heavy conditions over three days. The first day of the regatta was a passage race beginning in light winds from Sandringham Yacht Club to Blairgowrie. Each boat led at different stages, with VELOCE heading a long way to the right, so far, that we thought they had the course wrong, only to find a shift in breeze and come in 30 seconds ahead of JOUST after six and a half hours of sailing. SCARLET RUNNER was close behind, followed by JAKE and PLAYLIST. The Saturday began with fresh breeze and two windward-leewards were held in 20-30 knot breezes. This gave an opportunity for downwind planing and exciting sailing. VELOCE led JOUST on the first lap but a close gybing contest on the downwind run in 20 knots resulted in a victory to JOUST just ahead of VELOCE and SCARLET RUNNER. The second race was held in even heavier conditions and, not surprisingly, carnage followed. Every boat had its issues. JAKE blew a spinnaker. VELOCE dropped one over the side and SCARLET RUNNER had an impressive broach. The halyard stripped on JOUST and despite knifing the halyard and dropping the spinnaker, JOUST was able to finish on main alone to win that race with PLAYLIST second and SCARLET RUNNER third. 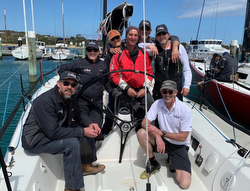 After a terrific regatta dinner on Saturday night at Blairgowrie Yacht Squadron, hosted by Robert Date (owner of SCARLET RUNNER), the final day of windward-leewards began in 10-15 knots. The first heat saw JOUST lead and extend to get their third heat win. In the second race, a very close start saw all boats vying for position. After an unexpected crash tack, JOUST was back in last position by several hundred metres, with SCARLET RUNNER leading, followed by PLAYLIST, VELOCE and JAKE. A good downwind shift allowed JOUST back into third place, but the heat win went to SCARLET RUNNER, with PLAYLIST a half-boat length ahead of JOUST in second. The final regatta standings saw JOUST first, SCARLET RUNNER second and PLAYLIST third. This will become an annual event. The five owners of the J/111 are great friends and excellent companions. 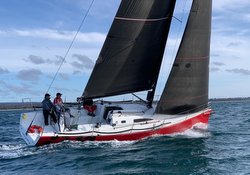 This class will surely grow and there is increasing interest around Port Phillip Bay, with a close racing, excellent performance, reasonable budget and great camaraderie.” Add to Flipboard Magazine.